1. Richard BADNALL, son of Richard Jnr. 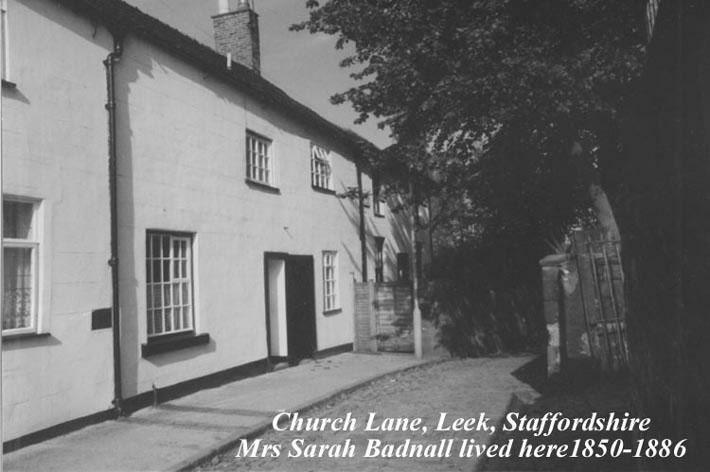 BADNALL (1797-1839) and Sarah HAND (1799-1886), was born on 27 May 1820 in Leek (11 am). He was baptised on 4 June 1821 in St. Edward's P.C. Leek, Staffs. Sponsors: Mary Cruso (his aunt); Richard Badnall + Enoch Hand (grandfathers). 2. Richard Jnr. BADNALL, son of Richard Snr BADNALL and Harriet HOPKINS, was born on 16 February 1797 in Leek, Staffs. He was a Silk manufacturer, railway engineer and poet. He was educated at Ashbourne Grammar School and Chaddesley, Worcs., He married Sarah HAND on 19 August 1819 in Uttoxeter Parish Church. The vicar was the Revd. HB Fowles. He died on 2 August 1839 in Weston near Bath. He was buried circa 7 August 1839 in the family vault, St. Edwards churchyard, Leek, Staffs.. The 1830s was, for all practical purposes, the first decade of rail travel and a period of rapid growth in the spread of this form of transport nationally. 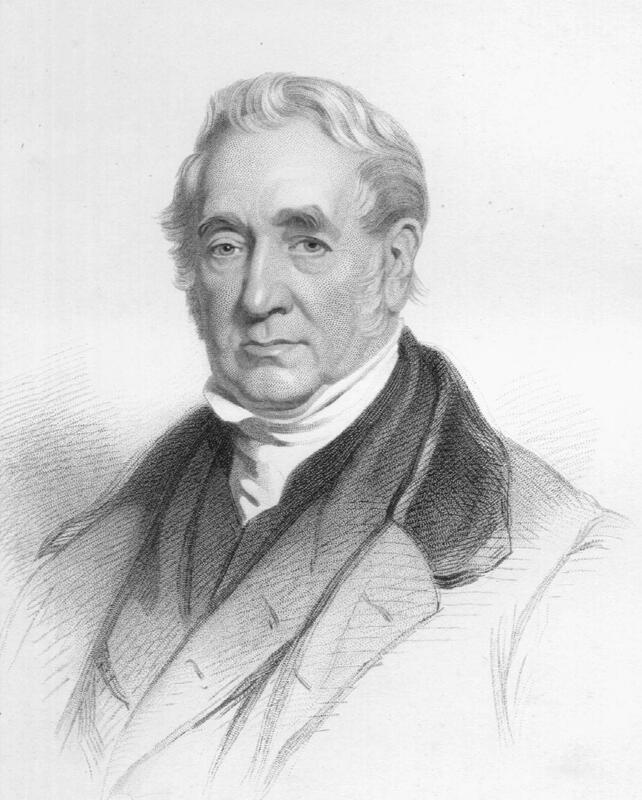 It was the period too, which established George Stephenson and his son Robert as the foremost railway engineers not only in Great Britain but also in the World. Their genius and perseverence enabled them to overcome the very considerable doubts which were expressed concerning the viability of railways. 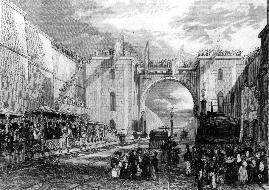 The success of the Liverpool to Manchester line created a considerable enthusiasm for new railway projects all of which required the services of engineers, not only to survey and plan the lines but also to take charge of the construction and commissioning of the line when Parliamentary approval had been obtained and the necessary finance found. The Stephensons, Brunel and other established engineers were thus in great demand, but they alone could not carry out all the projects and the high fees and salaries offered attracted new " railway engineers". Samuel Smiles describes how these engineers became leaders of the battle when two or more rival lines were planned between the same points. Such battles were trials of individual ambition as well as professional skill and considerable personal feeling was involved. According to Smiles "many new men laboured to mature and bring out railway projects more striking and original than anything heretofore proposed" and amongst this group of "fast engineers" he identified Isambard Kingdom Brunel, Dr Lardner and a certain "Mr Badnell". Both Lardner and Badnall were, according to Smiles, proponents of railways constructed with "rising and falling gradients" with Mr Badnell claiming that "an undulating railway was much better than a level one for the purposes of working". The Mr Badnell referred to by Smiles was Richard Badnall of Cotton Hall in Staffordshire . Richard Badnall, a Staffordshire man by birth, was the eldest son of Richard Badnall of Highfield, a Leek, silk manufacturer, banker and dyer. Richard Junior, was a well educated man, a poet, author and inventor who played the flute and whose romantic disposition is evident in his writings and in his choice of home. His book "the Legend of St.Kilda", "Jelinda: a Persian tale", and his poem "The Pirate" illustrates his Byronic, romantic, view of the past and the Staffordshire homes he chose for himself - Ashenhurst, Woodseaves and Cotton Hall - give further clues to his nature. His sister Mary Elizabeth Cruso, described him on one occasion as "as usual full of schemes " and of "talking up and down the town (Leek) of his plans for enriching himself and his family". In 1837, after hearing that her brother proposed to stand as a Parliamentary candidate for Newcastle-under-Lyme, she described him as "strange in his proceedings". 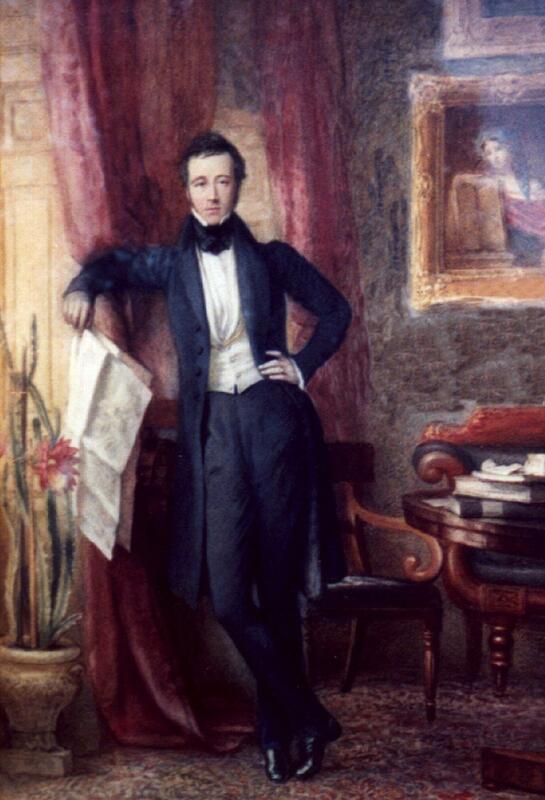 He was also, for a time, a silk manufacturer and dyer and perhaps would not have ventured into railway engineering had not his first partnership with his brother in law Henry Cruso and Francis Gybbon Spilsbury come to an early and abrupt end in 1826 with the bankruptcy of the partners and the parents of both Badnall and Spilsbury. Following the announcement of his bankruptcy, Richard Badnall Junior had tried strenuously, both in this country and in France, to remedy matters, pay his creditors and sustain his wife and their young family. 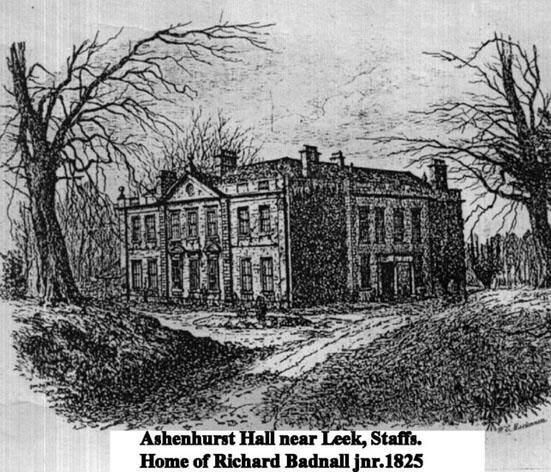 The contents of Ashenhurst were sold off and his wife's uncles, Samuel and William Philipps, took over the considerable mortgage on the property. For several years Badnall's life was extremely unsettled and between 1827 and 1832 he lived at six different addresses in London & Liverpool before going to live with his father in Liverpool. For much of this time he appears not to have had any settled occupation, except for a short period when he acted as a silk broker and merchant. 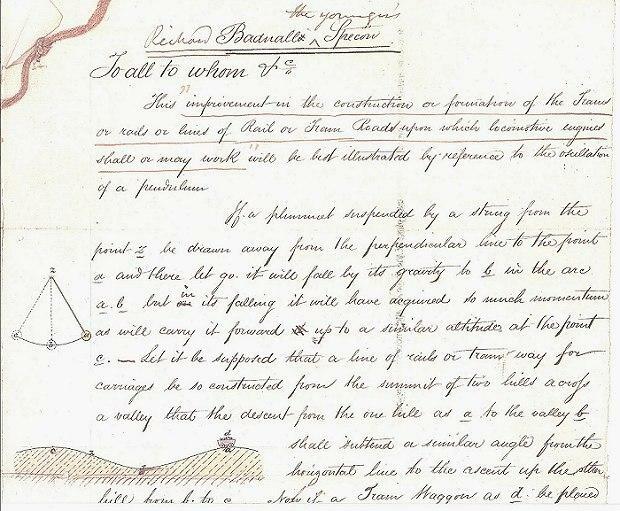 In 1832 his petition as an insolvent debtor was heard at Lancaster Court and later that year a patent application revealed that, although he may have been without an occupation, his mind was as active as ever. It was this patent that formed the chief item of discussion between Richard Badnall and Robert Stephenson, younger brother of George Stephenson, over dinner at the Manchester home of JL Gardener, and subsequently led to the formation of the Stephenson & Badnall partnership to exploit the patent's potential. Richard Badnall Junior was born in Leek at the turn of the 19th century. He was the son of one of the town's most successful silkmen, Richard Badnall of Highfield, Leek whose family firm had been established in the town for some 75 years. Richard Junior eventually took over the family firm in 1824 when his father decided to concentrate on his young family, his duties as a JP and his farm. Richard Junior entered into partnership with his brother-in-law Henry Cruso and Francis Gybben Spilsbury and began to develop the firm to exploit their various patents relating to tanning and the manufacture of silks. Unfortunately, they entered into the euphoria of the times and within a short time they were bankrupt and their failure subsequently caused the bankruptcy of Richard Badnall, senior. Following a period in which he kept moving from place to place in a vain attempt to restore the family fortunes, he lived for a while on the Isle of Man and whilst there developed his theories of the "Undulating Railway". Though his theory proved in the end to have been flawed he was convinced of the value of his railway design, primarily because of the practical tests which he had carried out using, initially, clockwork models but subsequently, the real trains of the Manchester & Liverpool Railway. There is a lengthy correspondence in the Mechanics Magazine in which he vigorously defended his ideas. In 1833 he entered into partnership with Robert Stephenson, senior, of Pendleton Colliery, to exploit the undulating railway patent. Richard Badnall was politically a Whig, and had a somewhat romantic nature. He wrote poetry and several books, registered several patents for improvements in silk machinery and stood as Parliamentary candidate for Newcastle-under-Lyme in the elections of 1837. He appears to have had a tendency to enjoy the fruits of success before they had been harvested. For example, on first entering into partnership with Cruso and Spilsbury, he took on a mortgage of ?2,000 in order to acquire the Ashenhurst estate near Leek, and following his bankruptcy continued to try to live in a style which his income couldn't maintain. Unfortunately too, he suffered all his life from gout, and the combination of this and the stress under which he lived from 1827 resulted in his death in 1842, at the relatively early age of 42. There are copies of correspondence between Badnall and Sir Robert Peel, William Huskisson and Robert Stephenson, all concerning his Undulating Railway, in the British Library. See: "A Wild Ride on Badnall's Famous Undulating Railway," by Joseph C. Merideth - extensive article on Richard Badnall in Railroad History 178 (Spring 1998), published by the Railway and Locomotive Historical Society Inc. (ISSN00907847) . Richard Badnall was a well educated man, poet, author and inventor who played the flute and whose romantic disposition is evident in his writings and in his choice of home. His book "the Legend of St.Kilda", "Zelinda: a Persian tale", and his poem "The Pirate" illustrates his Byronic, romantic, view of the past and the Staffordshire homes he chose for himself - Ashenhurst, Woodseaves and Cotton Hall - give further clues to his nature. His sister Mary Elizabeth Cruso, described him on one occasion as "as usual full of schemes " and of "talking up and down the town of his plans for enriching himself and his family". In 1837, after hearing that her brother proposed to stand as a Parliamentary candidate for Newcastle-under-Lyme, she described him as "strange in his proceedings". He was also, for a time, a silk manufacturer and dyer and perhaps would not have ventured into railway engineering had not his first partnership with his brother in law Henry Cruso and Francis Gybbon Spilsbury come to an early and abrupt end in 1826 with the bankruptcy of the partners and the parents of both Badnall and Spilsbury. Following the announcement of his bankruptcy, Richard Badnall Junior had tried strenuously, both in this country and in France, to remedy matters, pay his creditors and sustain his wife and their young family. 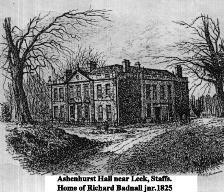 The contents of Ashenhurst were sold off and for several years Badnall's life was extremely unsettled before he went to live with his father in Liverpool. In 1832 his petition as an insolvent debtor was heard at Lancaster Court and later that year a patent application revealed that, although he may have been without an occupation, his mind was as active as ever. 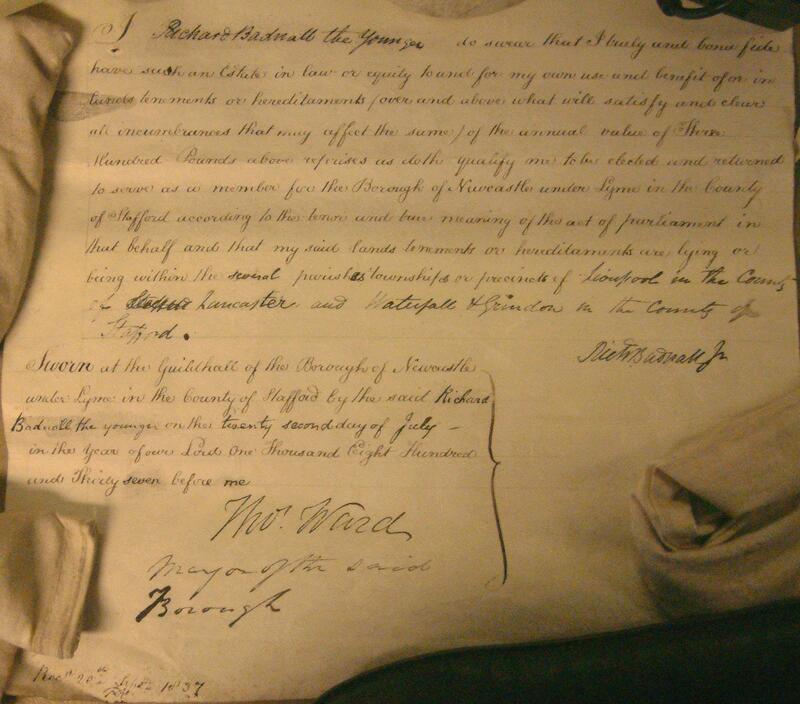 It was this patent that formed the chief item of discussion between Richard Badnall and Robert Stephenson, younger brother of George Stephensonwhich led to the formation of the Stephenson & Badnall partnership. The debate about Richard's proposed "Undulating Railway", in which he proposed a line which would have a constant though shallow gradient, became a matter of national and parliamentary discussion. Although the idea was eventually shelved, with Richard's contemptuous cirtics seeming to put him in his place for "bad science", Richard possibly had the last laugh, as his idea was taken up by Benjamin Baker, who built the first line of the London Underground, using the principle of an undulating railway. Unfortunately Richard suffered all his life from gout, and the combination of this and the stress under which he lived from 1827 resulted in his death in 1842, at the relatively early age of 42. September 8,1832. 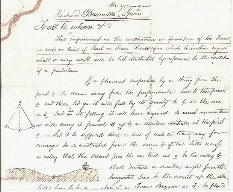 The patent granted on Sept.8, 1832, to Richard Badnall for his new system of rail-way in which great economy of working was to be obtained by running the trains on an undulating track having long descents and comparatively short ascents, aroused a lengthy discussion, sponsors and opponents of the scheme having a battle royal in the pages of the Mechanics' Magazine and other journals throughout the years 1833 and 1834. 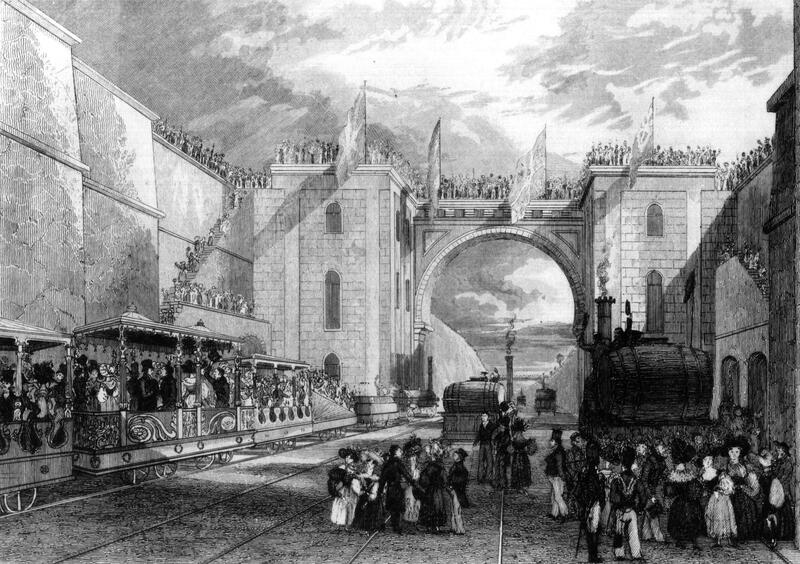 Experiments were actually carried out on a section of the Liverpool and Manchester Railway with Stephenson's Rocket and other locomotives, but proposals for further trials of the system were abandoned. 3. 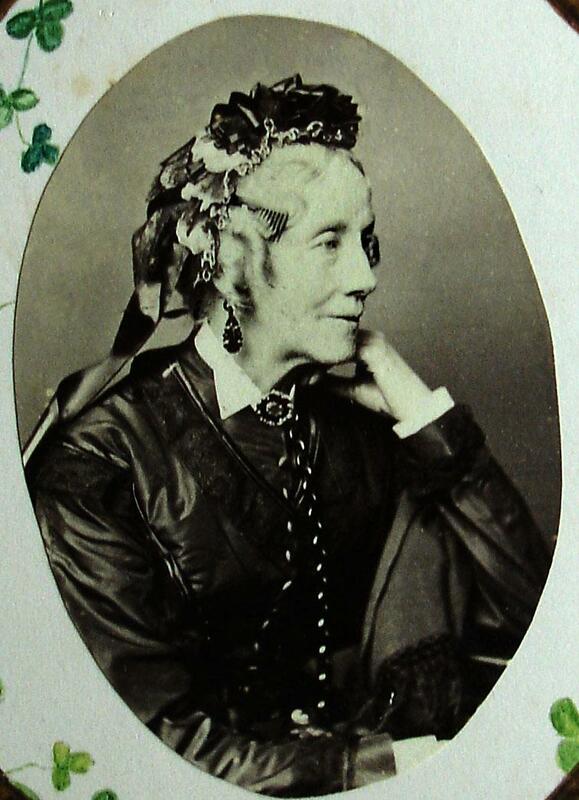 Sarah HAND, daughter of Enoch HAND and Mary PHILLIPS, was born on 21 January 1799. She was born on 21 October 1800 in Uttoxeter, Staffs. She died on 22 January 1886 in Church Lane, Leek, Staffordshire. She was buried on 27 January 1886 in Family Vault, St. Edwards churchyard, Leek, Staffs.. This is the last will and testament of me Sarah Badnall of Leek in the County of Stafford, widow, I bequeath to my dear son Hopkins the large water colour painting of his Father, also my Gold Watch , all my silver and silver plated articles. I direct the Trustees of my will to divide in their discretion such of my books pictures prints and household goods and furniture (excepting the silver and silver plated articles herinbefore bequeathed) as they shall think proper amongst themselves and my other children. I devise all the real estate to which I shall be entitled at my death and I bequeath the residue of my personal estate to which I shall be entitled to my said son Hopkins and my son William Beaumont Badnall their heirs executors administrators and assigns respectively upon trust to sell my real estate together or in parcels by public auction or private contract with power to make any special conditions to title or otherwise and with power to buy in the premises at any public sale or to rescind either on terms or gratuitously any contract and to resell without being answerable for any loss and to convert and get in my residuary personal estate and to stand possessed of the monies to arise from such real and residuary personal estate Upon trust for my said son Hopkins, my daughter Harriet Hopkins the wife of Charles Bower May and my sons Edward Wykeham, and Charles Henry Fiennes, in equal shares taking into account the sum of ?0 which I have advanced to my son Edward and the sum of Three hundred pounds which I have advanced to my said son Charles so that my said sons Edward and Charles shall receive their respective shares less the said sums so advanced to them respectively as aforesaid and as respects the share of each of my said sons Edward and Charles I empower the Trustees of my will to pay such share or interest thereof to him in such manner at such time or times and in such proportions the said Trustees shall in their discretion consider most beneficial for him and I empower the Trustees of my will to invest the shares of my said sons Edward and Charles or any part or parts thereof respectively in their names in the public funds or government securities in the United Kingdom or on real securities in England and Wales or on Railway Debentures and to vary such investments at their discretion for any of the others of the kinds prescribed. I declare that the receipts of my Trustees for any money paid to them in that character shall exonerate the person paying the same from all liability in respect of the application thereof I direct as regards the Trusteeship of my said sons Hopkins and William that vacancies occurring therein from death in my lifetime or otherwise disclaimer resignation or incapacity shall from time to time be supplied by the other Trustees or Trustee for the time being or if non such then by the disclaiming or resigning Trustees or Trustee or if also non such then by the executors or administrators of the last deceased Trustee. I appoint my said sons Hopkins and William Beaumont to be executors of my will and lastly I revoke all former and other wills. In witness whereof I have hereunto set my hand this fifteenth day of February one thousand eight hundred and sixty one. Signed by the Testatrix as her last Will and testament in the presence of us present at her request in her presence and in the presence of each other have subscribed our names. Isaac Cope, John Brearley, Leek, Staffordshire. Hopkins BADNALL (1821-1892). Hopkins was born on 12 September 1821 in Leek, Staffordshire. He was christened on 24 September 1822 in St. Edwards Leek, Staffs.. He was an Archdeacon of Cape Town, Vicar General of Capetown. He also founded Bishop's Diocesan School and was vice-chancellor of the University of the Cape of Good Hope. He appeared in the census. He was educated at Durham University, BA, MA1851, DD1870, He was Curate in Stockton-on-Tees in 1845. He accompanied Bishop Gray in 1847 in South Africa. He married Sarah Elizabeth OWEN-SMITH on 27 February 1854 in St. Mary's Cathedral, Port Elizabeth. He became Rector of Goldsborough in 1855. He became Rector of Cawthorne in 1857. He became Vicar of Fishlake in 1886. He died on 27 September 1892 in 19 Randolf Rd., Maida Vale, London. He was buried on 1 October 1892 in Family Vault, Leek, Staffs..
William Beaumont BADNALL (1823-1901). William was born on 7 October 1823 in Leek (8.55pm). He was born on 7 October 1823 in Leek. He was christened on 31 December 1824. He was baptised on 31 December 1824 in St. Edward's P.C. Leek, Staffs. He was a Conveyancing Barrister, County Councillor (Derbyshire). He was a Conveyancing Barrister, County Councillor (Derbyshire). He married Jane Elizabeth CRUSO circa September 1854. He died on 31 May 1901 in 4 Kennsington Court Gardens, Middlesex. He was buried on 1 June 1901 in Thorpe by Dovedale, Derbyshire. Harriet Hopkins BADNALL (1825-aft1881). Harriet was born on 20 October 1825 in Ashenhurst Hall, Leek (11.57pm). She died after 1881. Edward Wykeham BADNALL (1831-1863). Edward was born on 27 May 1831 in Wavertree Nook (alias Olive Vale), nr. Liverpool. He died on 31 August 1863 in Church Lane. He was buried on 5 September 1863 in Family vault, St. Edward's Churchyard, Leek, Staffs. Charles Henry Fiennes BADNALL (1833-bef1886). Charles was born on 9 January 1833 in Thomas Street, Douglas, Isle of Man. He was baptised in 1833 in St. Matthews Church, Douglas, I.O.M.. He was a Journalist. He married Hannah WHITWORTH in 1864 in Australia. He died before January 1886. 4. 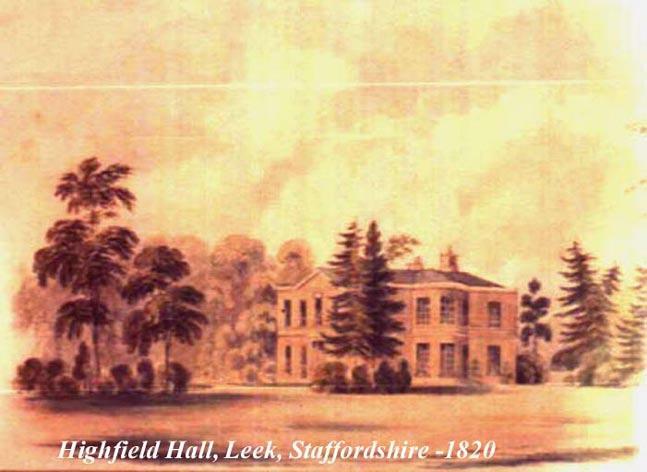 Richard Snr BADNALL (also known as Richard BADNALL of Highfield), son of Joseph BADNALL and Martha PRATT, was born on 28 February 1770 in Leek, Staffordshire. He was a Silk Manufacturer, Magistrate. He was educated at 28 Jan 1784 Entered Manchester Grammar School. 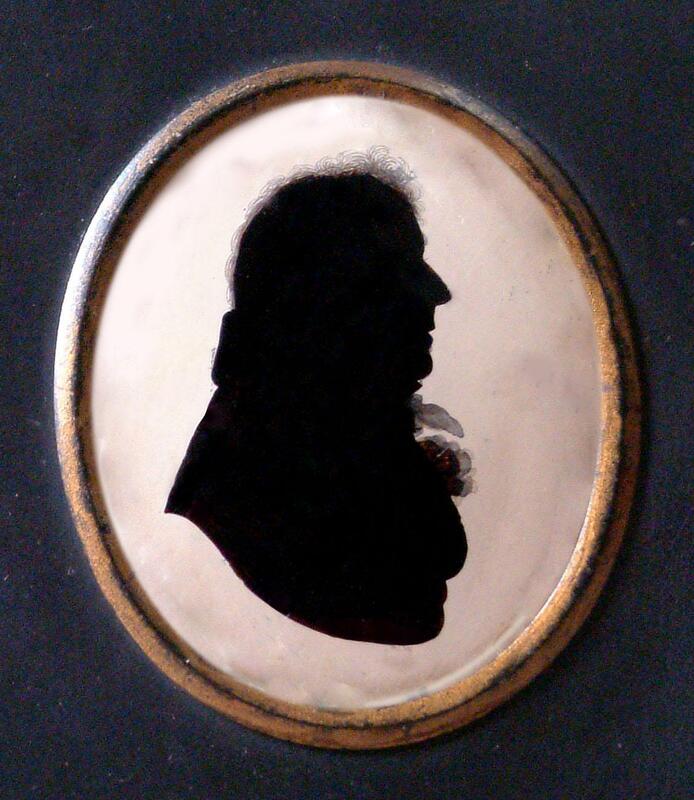 He married Harriet HOPKINS on 20 June 1793 in Prestbury Parish Church, Cheshire. He married Sarah JOHNSON on 21 October 1821 in Harbourne, Staffordshire. He died on 28 February 1838 in Pythian Street. Liverpool. He was buried in March 1838 in the family vault, St. Edwards churchyard, Leek, Staffs..
... of Highfield (House in Leekfrith). 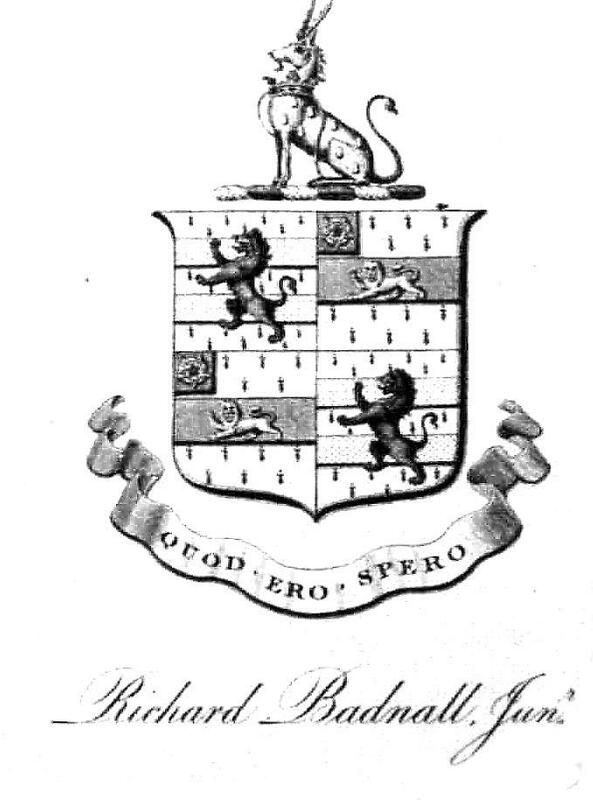 Richard Badnall was educated at Manchester Grammar School (entered 28/1/1784). He was a Silk Manufacturer and Magistrate. Richard Badnall Senior, a silk dealer, banker and magistrate, prospered in the first quarter of the 19th century and became increasingly involved in Leek affairs - amongst other things through his appointment as a Commissioner under the Town Improvement Act of 1825. When his first wife died in March 1820 he re-married. In 1824 he retired from active involvement in business, transferring much of his interest in the firm to a new partnership (Badnall, Spilsbury and Cruso) formed by his son Richard Jnior, his son-in-law Henry Cruso and the Walsall inventor, Frances Gybbon Spilsbury. Unfortunately the new partnership was formed just prior to a banking crisis and a depression in the silk trade, compounded by the abolition of protective duties on the importation of silks. The firm got into difficulties and in December 1826 were declared bankrupt. The bankruptcy of the Badnall, Spilsbury & Cruso partnership led to the bankruptcy of Richard Badnall, senior, who had mortgaged his home, Highfield, to obtain a ?0,000 loan from the Bank of England to help "these young men" through the difficult period. Following the bankruptcy and the subsequent sale of his property in Leek, Mary Elizabeth's father moved to 1 Pythian Street, Liverpool. He became involved in shipping for a time but his living was precarious and in 1837 his son by his second wife, Thomas Pratt Badnall, wrote to his uncle John Cruso Junior suggesting that his father could "use a few pounds" (6th August 1837). Richard Badnall Senior had three other children by his second wife: Joseph, Henrietta and James Rathbone; he and his family remained in Liverpool until his death, on his 68th birthday, in 1838. Richard Badnall was educated at Manchester Grammar School. He was a Silk Manufacturer and Magistrate who prospered in the first quarter of the 19th century and became increasingly involved in Leek affairs - amongst other things through his appointment as a Commissioner under the Town Improvement Act of 1825. In 1824 he retired from active involvement in business, transferring much of his interest in the firm to a new partnership (Badnall, Spilsbury and Cruso) formed by his son Richard Jnior, his son-in-law Henry Cruso and the Walsall inventor, Frances Gybbon Spilsbury. Unfortunately the new partnership was formed just prior to a banking crisis and a depression in the silk trade, and the firm were declared bankrupt in 1826, which led to the bankruptcy of Richard Badnall, senior, himslef, who had mortgaged his home, Highfield, to obtain a loan from the Bank of England to help "these young men" through the difficult period. Later, he became involved in shipping for a time but his living was precarious and in 1837 his son by his second wife, Thomas Pratt Badnall, wrote to his uncle John Cruso Junior suggesting that his father could "use a few pounds" (6th August 1837). Richard and his family remained in Liverpool until his death, on his 68th birthday, in 1838. James Rathbone BADNALL ( - ). James was born in Wavertree, Lancashire? Thomas Pratt BADNALL (c. 1824-1854). Thomas was born circa 1824 in Highfield Hall, Leek, Staffs. He was baptised on 18 July 1824 in St. Edward's P.C. Leek, Staffs. He was a Banker. He died on 27 August 1854 in New York, USA. Joseph BADNALL (1827-aft1837). Joseph was born on 10 December 1827 in Leek, Staffs.? He was baptised on 2 May 1829 in St. Edward's P.C. Leek. He died after 1837. Sarah Henrietta BADNALL (c. 1834-1900). Sarah was born circa 1834 in Tottenham, London. She died on 10 February 1900 in Leigh Cottage, Red Hill, Arnold, Nottingham. Martha BADNALL (1798-1879). Martha was born on 9 October 1798 in Leek, Staffs. She died in 1879 in Nottingham. She was buried in 1879. Mary Elizabeth BADNALL (1795-1850). Mary was born on 2 February 1795 in Leek. She married John CRUSO on 23 May 1816 in St. Edwards Church, Leek, Staffs.. She died on 17 August 1850 in Leek. She was buried on 25 August 1850 in Cruso Family Vault, St. Edwards churchyard, Leek, Staffs..
William BADNALL (1803-1859). William was born on 13 October 1803 in Leek. He was baptised on 27 April 1804. He was Vicar of Wavertree and Chaplain to the Duke of Cambridge, Queen's. He was educated at Kings School, Macclesfield and Brasenose College, Oxford. He married Elizabeth Rose PARR on 16 July 1833 in Childwall, Lancashire. He died on 28 July 1859 in Wavertree, near Liverpool. He was buried in July 1859 in Wavertree nr. Liverpool. Harriet BADNALL (1806-1812). Harriet was born on 20 January 1806 in Leek. She died on 16 October 1812 in Leek. She was buried in October 1812 in the family vault. 6. Enoch HAND was born circa 1770. He was a Solicitor and coroner of the Totmanslow Hundred. Staffs. He died on 8 March 1834. He was buried in March 1834 in Uttoxeter, Staffs.. He married Mary PHILLIPS. According to county records, Enoch (or Enock) was buried March 12 1832, aged 62. John HAND (bap.1801, d.1870). John was baptised on 25 December 1801. He was a Rector of Handsworth. He died on 9 September 1870 in Cheltenham, Gloucestershire. He was buried in September 1870. Charles Phillips HAND ( -1850). Charles died in 1850 in Douglas, Isle of Man.. He was buried in 1850 in Douglas. Mary Anne HAND (1808?- ). Mary was born in 1808 (estimated). She was baptised on 14 December 1808 in Uttoxeter. Eliza HAND (bap.1814). Eliza was baptised on 3 July 1814 in Uttoxeter.